The World Wide Web, or "the Web" as it's commonly called, represents an important departure from more traditional network communications protocols such as Telnet and FTP. Where prior network protocols were special purpose in terms of both function and media formats, the Web is highly versatile. The Web was the first form of digital communication that had rendering and browsing utilities adequate to allow any person or group with network access to share media-rich information with anyone else. The Web represents a major paradigm shift in networked computing, both in terms of delivery of information and inter-personal, though not in-person, communication. Formally, the Web is a client-server model for packet-switched, networked computer systems that utilizes a few key Internet protocols. The client handles all of the interaction with other components of the computing environment (i.e., other desktop applications and the server) and temporarily retains information for perusal. The networked servers are information repositories which host software to serve client requests. The procedural "glue" which makes the client-server interactivity possible is the concurrent support, by both client and server, of the protocol-pair, HyperText Transfer Protocol (HTTP) and HyperText Markup Language (HTML). The former establishes the basic handshaking procedures between client and server, while the latter defines the organization and structure of Web documents to be exchanged. At this writing, the current HTTP version is 1.0, while adoption of version 3.2 of HTML should take place by late 1997.
the Web is an enabling technology - The Web was the first widespread network technology to extend the notion of virtual network machine to multimedia. While the ability to execute programs on, and retrieve content from, distributed computers was not new (e.g., Telnet and FTP were already in wide use by the time that the Web was conceived), the ability to produce and distribute media-rich documents via a common, platform-independent document structure, was new to the Web. the Web is a unifying technology - The unification came through the Web's accommodation of a wide range of multimedia formats. Since such audio (e.g., .WAV,.AU), graphics (e.g., .GIF,.JPG) and animation (e.g., MPEG) formats are all digital, they were already unified in desktop applications prior to the Web. The Web, however, unified them for distributed, network applications. One Web "browser", as it later became called, would correctly render dozens of media formats regardless of network source. the Web is a social phenomena - The Web social experience evolved in three stages. Stage one was the phenomena of Web "surfing". 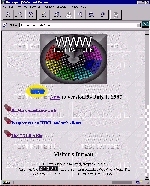 The richness and variety of Web documents and the novelty of the experience made Web surfing the de facto standard for curiosity-driven networking behavior in the 1990's. The second stage involved such Web interactive communication forums as Internet Relay Chat (IRC), which provided a new outlet for interpersonal but not-in-person communication. The third stage, which is in infancy as of this writing, involves the notion of virtual community. The widespread popularity and social implications of such network-based, interactive communication is becoming an active area in computing research. A major problem of self-selection surveys, where subjects determine whether, or to what degree, they wish to participate in the survey, is that the samples are likely to be biased. In the case of the Web survey, for example, the authors recommend that the readers assume biases towards the experienced users. As a consequence, they recommend that readers confirm the results through random sample surveys. Despite these limitations, however, the Web Surveys are widely used referenced are among our best sources of information on Web use. An interesting byproduct of these surveys will be an increased understanding of the difference between traditional electronic surveying methodologies and a concern over possible population distortions under a new, digital lens. One may only conjecture at this point whether telephone respondents behave similarly to network respondents in survey settings. In addition, Web surveyors will develop new techniques for non-biased sampling which avoids the biases inherent in self-selection. The science and technology behind such electronic sampling may well be indispensable for future generations of Internet marketers, communicators, and organizers. The Web was conceived by Tim Berners-Lee and his colleagues at CERN (now called the European Laboratory for Particle Physics) in 1989 as a shared information space which would support collaborative work. Berners-Lee defined HTTP and HTML at that time. As a proof of concept prototype, he developed the first Web client navigator-browser in 1990 for the NeXTStep platform. Nicola Pellow developed the first cross-platform Web browser in 1991 while Berners-Lee and Bernd Pollerman developed the first server application - a phone book database. 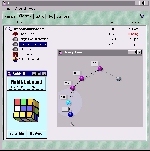 By 1992, the interest in the Web was sufficient to produce four additional browsers - Erwise, Midas and Viola for X Windows, and Cello for Windows. The following year, Marc Andreessen of the National Center for Supercomputer Application (NCSA) wrote Mosaic for X Windows which soon became the browser standard against which all others would be compared. Andreessen went on to co-found Netscape Communications in 1994 whose current browser, Netscape Navigator, is the current de facto standard Web browser. (see Figure 2). Figure 2. Navigator 3.x is a recent generic "navigator/browser" from Netscape Corporation. Displayed is a vanilla "splash page" for the Web Test Pattern - a test bench for determining the level of HTML compliance of a browser. Most Web resources at this writing are still set up for non-interactive, multimedia downloads (e.g., non-interactive Java animation applets, movie clips, real-time audio transmissions, text with graphics). This will change in the next decade as software developers and Web content-providers shift their attention to the interactive and participatory capabilities of the Internet, the Web, and their successor technologies. But at this writing, the dominant Web theme seems to remain static HTML documents and non-interactive animations. Web technology evolved beyond the original concept in several important respects. 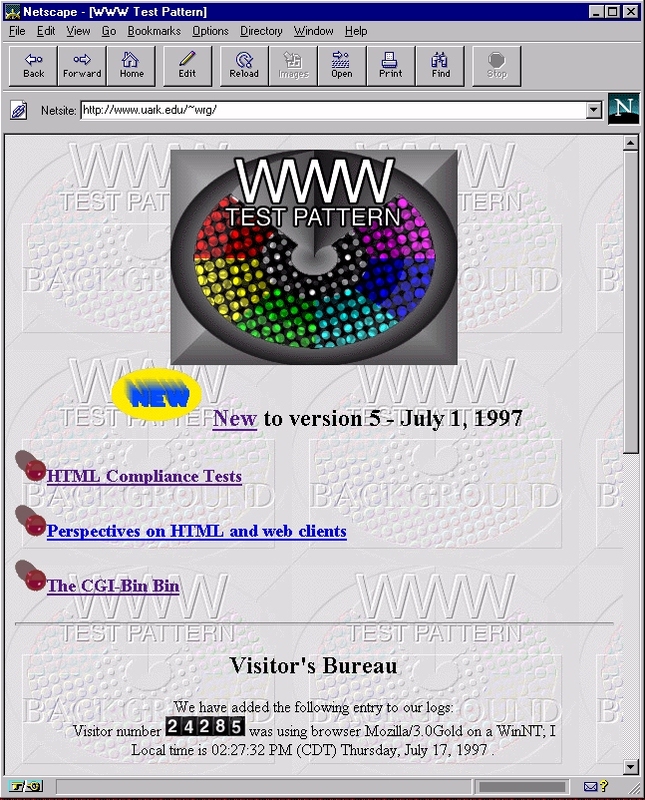 For one, the support of the Common Gateway Interface (CGI) within HTTP in 1993 added interactive computing capability to the Web. Perhaps the most important use of CGI to this point has been the processing of CGI forms which enable input from the Web user-client to be passed to the server for processing. While, in theory, CGI programs can provide server-side programming for virtually any Web need, network bandwidth constraints and transmission delays may make some heavily interactive and volumetric applications infeasible. Second, "plug-in" technology increased the media-rendering capability of browsers while avoiding the time-consuming spawning of so-called "helper apps" through the browser's launchpad. The speed advantage of the plug-ins, together with the tight coupling that exists between the plug-ins and the media formats which they render, make them a highly useful extension. Third, the advent of executable content added a high level of animated media rendering and interactive content on the client side. Such object-oriented network programming languages as Java produce platform-independent program modules which are executable on enabled Web browsers. Not surprisingly, this latest extension, that involves executing foreign programs which have been downloaded across the networks, is not without security risk. Fourth, we are beginning to see advanced information-gathering strategies which go beyond the original "information-pull" concept behind the Web. Where most users, perhaps through autonomous software agents, currently seek to draw information to them, solicited "push-phase" technology attempts to routinely and automatically dispense information to selected consumers (see Figure 3). Figure 3.Marimba Corporation's Castanet tuner with two channels open - one which animates binary tree growth as random values are inserted, and the other which supports interactive Rubik cube play. Within the past year several prototypes of solicited push netcasting have been deployed. Some, like Pointcast, consolidate and distribute information via a proprietary server-"transmitter". In this case, the client-side software behaves as a dedicated "peruser" for the transmissions. Other solicited push technology, such as Marimba's Castanet, contain a "tuner" which allows the client to connect to an arbitrary number of different servers. Each connection from the client to the transmitter is called a channel. We observe that CGI, plug-ins, executable content and push technology represent significant departures from the original browser-centric paradigm of Web information exchange, and add considerably to Web capabilities. Much of what little we know of Web behavior seems to be derived from two disparate sources. Descriptive statistics produced by the Web surveys are most useful to measure isolated events and independent activities - e.g., how many Windows users used Netscape. How central is location transparency to Web use? To what extent can the effects of information overload be avoided by advanced information retrieval methods? The World Wide Web represents the closest technology to the ideal of a completely distributed network environment for multiform communication. As such, it may be though of as a paradigm shift away from earlier network protocols. Many feel that the most significant impact of the Web will not be felt until the 21st century, when technologies are added to make the Web fully interactive, participatory and immersive by default. Berghel, H., " The Client Side of the Web " Communications of the ACM, 39:1, (January, 1996), pp. 30-40. Berghel, H., " Email: the Good, the Bad and the Ugly" Digital Village, Communications of the ACM, 40:4 (April, 1997), pp. 11-15. Berners-Lee, T., WWW: Past, Present and Future, Computer, 29:10, October, 1996. pp. 69-77.